I’ve never been to a real family reunion, with the matching t-shirts and everything, but I kind of feel like I’m part of an ongoing one through Facebook these days. Cousins, aunts and uncles I haven’t seen in 10, 20 years or more are popping up on my “friends” list almost every day. I actually think this is pretty cool! I have a pretty large extended family on the East Coast – growing up in California, I didn’t have the chance to see them too often. It’s been nice to reconnect online. My cousin Celeste, who I haven’t seen since I was probably in junior high, recently mentioned to me on Facebook that her mother (my aunt) likes to add chocolate to her banana bread. It’s a small detail, but I appreciated knowing it. Celeste also happens to run her own catering business (if you’re in the Boston area, check out her menus!) – maybe this penchant for cooking is a family trait! 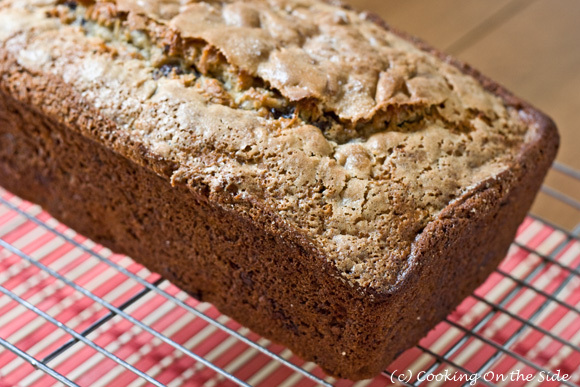 Inspired by my Aunt Pearl, I’m sharing a terrific recipe for Chocolate Chunk Banana Bread. This one is definitely on the dessert-cakey end of the banana bread spectrum (my preferred end), but I had no problem slicing off pieces at breakfast time as well. It comes out incredibly moist and – from the sprinkling of sugar on top – with a sweet, crinkly crust I wanted to scrape off and eat on its own. Mash bananas, measure 1 1/2 cups and set aside. In a medium-size bowl, stir together flour, dry milk, baking soda, baking powder, sugar and salt. Add remaining ingredients and bananas. Stir until blended. Pour into a greased 8×4-inch or 9×3-inch loaf pan. Sprinkle sugar over top, if desired. Bake for 60-65 minutes or until a skewer comes out clean. Cool 10 minutes and remove from pan. Haven’t had banana bread (or muffins) in quite a while. Love the chocolate chunk in this and wishing I had a piece for my morning cup of coffee right now. 🙂 My family stays in touch via FB, too. They used to be here in SD, but are now mostly on the east coast. .-= kellypea´s last blog ..Michael Voltaggio’s Indian-Spiced Short Ribs =-. 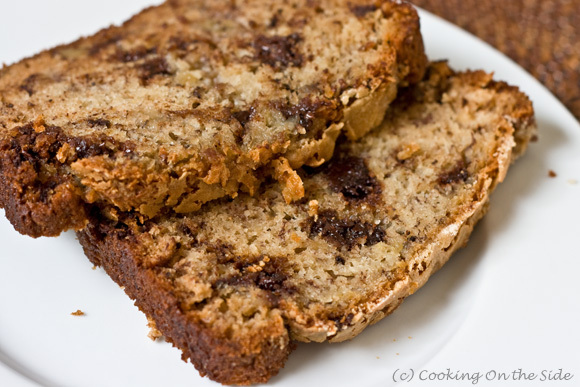 .-= dani´s last blog ..#75) Chocolate Swirl Banana Bread =-. .-= Cheri´s last blog ..Sweetheart Ice Cream Cakes with Strawberry Sauce =-. OMG. This looks delicious. I never would have thought about adding chocolate, but now that you mention it ~ it seems absolutely natural. 🙂 Can’t wait to try this one! .-= Jackie Lee´s last blog ..What You Need to Know Before Writing Your Guest Post =-. I totally come from one of those families with the matching t-shirts! Totally embarrassing but I love them all. .-= katerina´s last blog ..Risotto with Mushrooms and Red Wine =-.